My childhood Easters were a weekend of eating hot cross buns, picnics in the park and kite flying. We flew kites because it is believed that the significance of the kites soaring towards the heavens is representation of Christs resurrection. So on Easter Sunday or Monday, families would typically pack the car with goodies such as patties and cheese sandwiches and make their way to the park. My last 4 Easters spent in Guyana were spent at the National Park in Georgetown. Just a stone’s throw from the Atlantic Ocean, it was the perfect location to catch the perfect breeze. Can I say that my Easters in the US have been as memorable?? Nope..not by a long shot. Gone are the days spent in the warm sun flying a homemade kite while munching on buns…ah the days of yore. One tradition that does remain constant are the hot cross buns. I must admit that I didn’t know the true symbolism of hot cross buns and why it is eaten on Good Friday so I had to do some research. Turn out its an old English tradition that stems from Christian and pagan beliefs. Guyana being a former British colony still retains some of the traditions of our mother country and eating hot cross buns on Easter is one of them. Weeks ago I started researching hot cross buns recipes since I do not have one of my own. I’ve only made this once, so I’m fairly new to the cross buns game. The first try was a total disaster, I ended up with something that faintly resembled a cross bun. It was more like a rock with raisins in it. This year I shall redeem myself and make something not only delicious but worthy of its name. Where did I got to find said recipe?? www.allrecipes.com!! It turned out great, I’m currently licking frosting from my fingers as I type. Its a soft, light flavorful, spiced,bun, definitely worthy of the name Hot Cross Buns. Don’t have raisins? You can use currants, cherries or cranberries, it’s all up to you. Happy Easter! Sprinkle the yeast over the warm water and let stand until dissolved, about 5 minutes. Place the flour, salt, sugar, cinnamon, nutmeg, 1 1/4 cups of milk, butter and egg in a stand up mixer. Pour the yeast mixture on top. With the dough hook, mix for about 5 mins until well combine. If using raisins, add them and mix for additional 2 mins. Cover and let rise for 1 hour.After 1 hour, punch dough down and pour on tol a floured surface. Knead lightly for about 1 to 2 mins. Divide into 12 portions and shape into balls. Place 8 pieces into a greased 9×13 inch baking dish, and the additional 4 in a 8x8inch baking dish. Cover with plastic wrap and set aside to rise until doubled in size, about 45 minutes. Preheat the oven to 350 degrees F. Remove the plastic wrap from the rolls. Mix 1 egg yolk plus milk and brush tops off rolls. Bake in the preheated oven until golden brown, 20 to 25 minutes. Remove from oven and brush with glaze. Allow to cool completely before adding frosting cross. For Glaze, place sugar, water and vanilla in a small pot and cook for a bout 5 mins. Brush glazed over buns when hot. Make frosting by whisking together the confectioners’ sugar and milk until smooth. When the buns are cool, drizzle frosting over them in a cross shape. Previous Post A dream come true. Awww…thank you so much!! You know my brother?? Now I’m curious to know more about you. that sugar glaze looks lovely! i’d like mine with some butter! I have tried your doubles recipe and it came out very good, thank you, you have reminded me of what I enjoy doing. I had stopped baking for awhile. Your recipies took me home. Your site is user friendly. Now I on my way to try your hot cross buns. This looks absolutely tasty and reminds me of my childhood where my grandma made these delicious buns. Now I live in a latinamerican country and they make buns that are good enough to build a road. I so wanna lick those buns… yum!!! These look good! I didn’t make mine this year. My mom sent me some… looking at yours is tempting me too though! I am usually make buns but i will try this recipe, looks good. 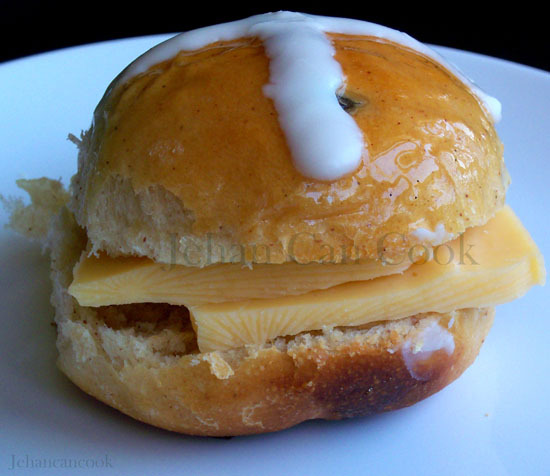 Made your cross buns and coconut buns recipes with my daughter Good Friday…BIG HIT!!! Our family and friend ENJOYED them. Thanks very much for sharing. Oh man Hot cross buns.. I still remember the commercial on tv with the old lady.. Hot cross buns! I am so making this this yr… totally agree with u here… i miss my kite flying days at 63 beach! Since discovering your web site I have been trying all your recipes and I must say I have not had any failures. Thank you for visiting and giving my recipes a try. Its always pleasing to receive comments like yours. All the food you post look so good, i’ll have to get my friend Michelle to try to make some of them for me, Good Job. BTW, do you have a recipe for Cassareep Chicken ? Hi Andy, thank you so much. I don’t have a recipe for Cassareep Chicken. Hot out of the oven and delicious! My folks love them. I wish I could make all of the delicious foods you post. Hi Christine, the 1/4 oz package is the same size and the size mentioned in the recipe. Wow! These look fab, much better than the ones I posted about last Easter. Thanks for sharing with me how they SHOULD be made. I will be sure to make these ones next Easter. Pamela, you can use a converter online that will convert the measurements to whatever unit of measurement you use in Suriname. I would suggest baking the cross buns in the middle rack in the oven and check to make sure your oven is correctly calibrated. Make sure that you are baking it at the temperature suggested. Hi, is it possible to do this without a mixture? Vanessa I don’t understand the question. What mix are you referring to? Jehan, thanks for sharing your recipes. I’m becoming great in the kitchen and my husband who knows to cook more than I do is happy with my foods especially the baking. I am however horrible at math, I know I can Google this but here I go. The .25oz how much does that translate into tablespoon or teaspoon? I usually buy the bottle yeast. I find the packets loses its raising power if not used right away. Hi jehan sorry I’ve been really busy but I meant to ask if it can be done without a hand stand mixer as in using my hands to mix everything in? Vanessa, you absolutely can. But keep in the mind the dough will be a bit sticky.